Throughout this year, I’ve been planning an event in my fine home city of Norwich as I briefly mentioned in this blog post. And earlier this week, we launched! I’ve been a member of The AOI for many years now and each year I find more and more reasons to remain a member. From contract advice, to pricing, to portfolio, they’ve been such a valuable asset to my freelance career. So, one morning when I saw in a newsletter that there were AOI meet-up events hosted by members in Bristol and Glasgow, I immediately thought “Well why the hell not Norwich!?”. We are a city FULL of creatives; illustrators, musicians, designers, animators, game devs, the list goes on and on. Norwich is the perfect place for an AOI meet-up group, so I straight away emailed my thoughts on hosting events in the fine city and, to my delight, the reply was just as enthusiastically positive as I’d hoped! Since I was given the go ahead at the end of 2018 to coordinate these events in Norwich, I’ve been having an awesome time coming up with ideas and plans for our first one. I wanted it to be something impressive, something to immediately let people know that we mean business and we want to grow into something really amazing. I’ve always loved planning events, and for the last few years I’ve developed a mad love for public speaking and hosting as well, so this ticked all my boxes. With the invaluable help of The AOI and my incredible illustrator co-organisers, Sara Harrington & Fiona Gowen, we finally had our plans in place and we began the exciting process of getting tickets out into the big wide world. Sara designed us some gorgeous flyers and marketing illustrations, which I plastered absolutely everywhere I could. The amazing team at AOI then listed our tickets on Eventbrite and to our delight, within the first 24 hours, over a dozen had already sold. This only sped up, with all tickets being completely SOLD OUT by the night itself! It came around so quickly. I felt like I should have been more nervous, but we’d sorted everything! Speakers booked. Venue booked. Food & drinks sorted. Pub floor reserved. Roller banner on point. Slideshows lookin’ slick. We were ready to open the floodgates. Despite all tickets being sold out, I did expect to lose a few people and have a few empty seats because life just does that to peoples’ plans. But the room was absolutely packed! I saw lots of familiar faces, lots of fresh ones too, but all of them were smiley and ready to get started. Our venue was the beautifully fancy NUA’s Ideas Factory, we commandeered the conference room as well as the adjacent kitchen area for much needed drinks and biscuits. It was the perfect spot for our launch! After I had said my piece about our plans, The AOI, our speakers, and ourselves, the first of our amazing speakers took to the stand! The awesome Louise Cunningham spoke about how she’s worked at being visible to some of her dream clients (even Disney was on the ‘done’ list!) and the methods she’s used to do so. That was the whole theme for the evening, ‘Being a visible illustrator’. I wanted to focus on the actual things illustrators want to know about, instead of making yet another networking group or people coming in to simply speak about their work. 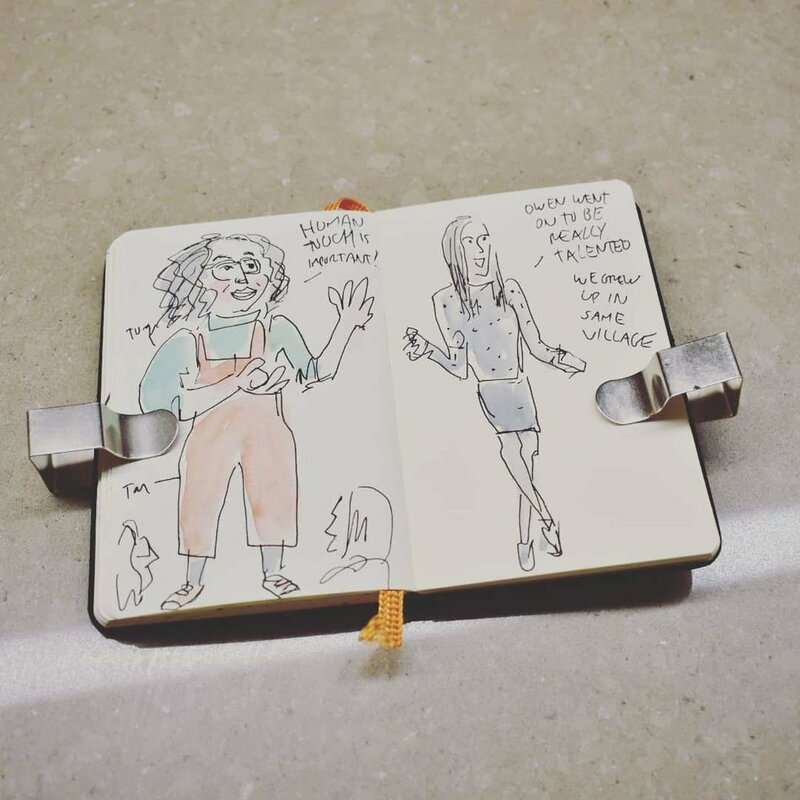 I want these meet-up events to be incredibly valuable to illustrators as well as fun! Louise did an amazing job introducing us to her client base and the broad range of resources and techniques she has used and seen return from. Next up was the brilliant Marianna Madriz! Being both a practicing full time illustrator and the members assistant for the AOI, Marianna was in a unique position to dish out both her own experiences and those that she’s seen whilst working with The AOI. Marianna brought an incredibly interesting insight into how to promote and market yourself offline as well as online. Book fairs, markets, and conventions were on her list of places to be when it comes to embedding yourself in the industry. 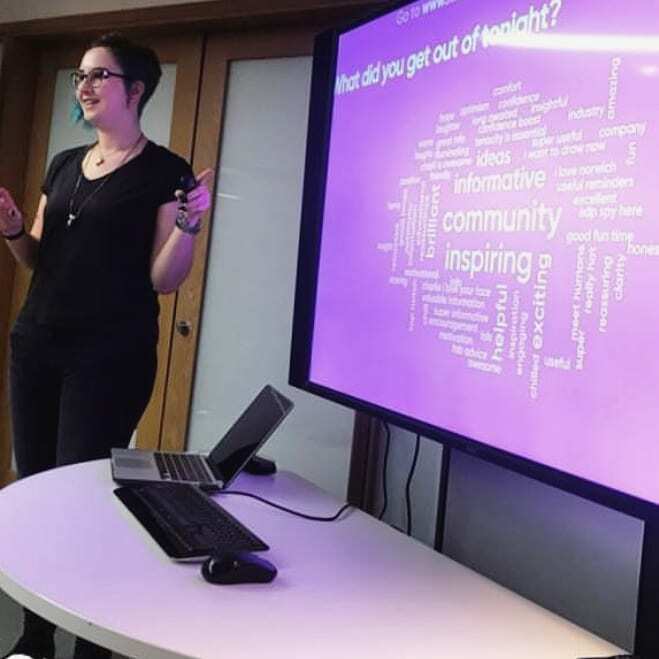 She also stressed the importance of being part of the community and finding your people, which linked quite nicely to the whole premise of Norwich AOI! And our final fantastic speaker was Sinead Birmingham! Sinead brought a third point of view to the discussion by being a curator of a brilliantly exciting exhibition in Norwich. This insight into the methods potential clients, curators, art directors, etc, will use to find creatives was so helpful. It can be tricky to leave the bubble when you’re right in the thick of your own marketing, so having somebody speak about the directions they were going in in order to find people was a great way to burst that bubble! With everybody’s brains buzzing with ideas and elaborate marketing campaigns for themselves, I wrapped up the speaker portion of the evening with something I’ve been super excited to use since I first saw it at a conference. I had a Mentimeter interactive slide show prepared for the audience to join in on with their phones. We generated a word cloud full of the words people would have used to describe what they got out of the night, and they were some damn fine words. I was so, so pleased to see so much positivity and drive in that word cloud, things like “I want to draw now” and “reassuring” were such nice things to read. As well as “Charli is awesome”… I was pretty happy to see that too. ;) I really felt like we’d achieved exactly what we’d set out to do with the first Norwich AOI event. OH BOY we didn’t stop there though. Speakers could finally breathe and everybody got up and started swapping business cards and having a laugh, but we had more plans before we all went to the pub. We wanted to offer informal portfolio reviews to make the most of our speakers’ advice and knowledge whilst they were with us for the evening. Everybody had the option to sign up for a review before the event started, and we were so pleased to see how many people brought along their gorgeous portfolios and let us have a good look through them all! The reviews started with everybody introducing their work and themselves whilst we all had a look at their portfolios, digital or physical. Then we went around the table and people asked the burning questions they had about what should go into the portfolio, what order, should it be specialised, should it be broad? We ended up chatting for almost 45 minutes about everything we could. Eventually we had to pack up our gear and shift into the venue to wrap up everybody’s night. We had hired one of the stunning top floor rooms at St Andrews Brew House for those attendees that might want to keep the party going and keep chatting to their new illustrator network. We had no idea how many would actually want to pop across the road with us and how many would want to go straight to bed (it was a school night, after all), but a huge chunk of our amazing guests were waiting in the hired room for us when we finished the portfolio reviews! Drinks were bought, burgers were devoured, and laughs were had right up until the very last of us sleepily wandered home at about midnight. 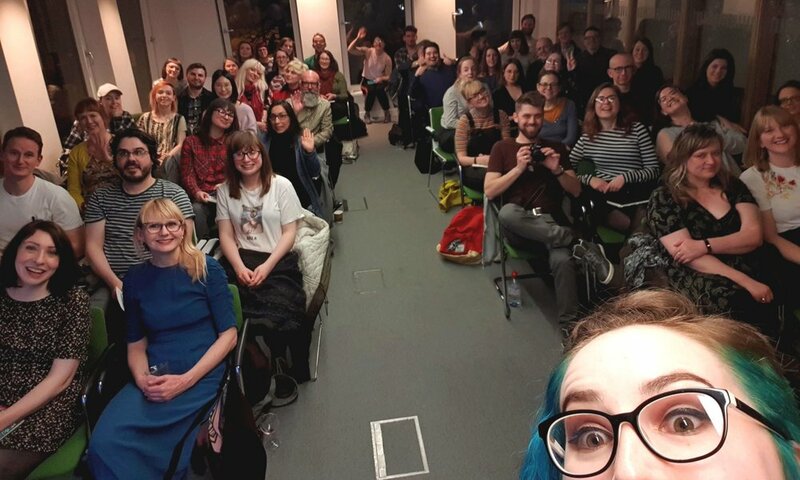 The first ever Norwich AOI event had come to a close and it had been more of a roaring success than I could have imagined. The main thing I really want to say is the biggest, most massive thank you. To everybody who bought tickets to the event and came along. To our AMAZING speakers who absolutely nailed it and inspired a room full of creative people. To the dream team, Sara and Fiona, who came along and made this mad plan actually work. 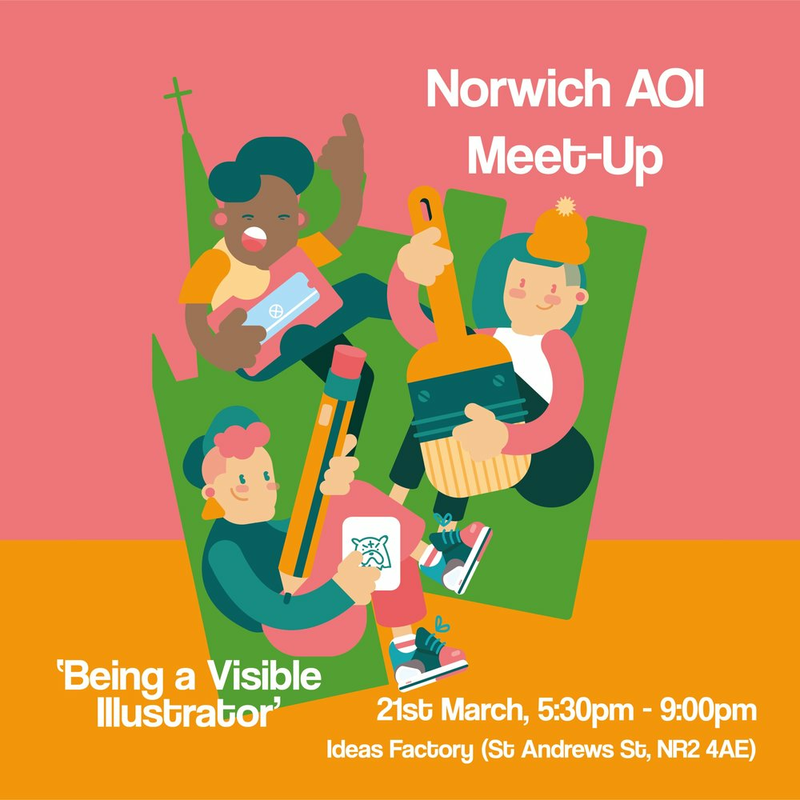 And to The AOI for being an outstanding and invaluable resource to all UK illustrators and for allowing me to take the meet-up reigns here in Norwich. I am crazy excited to see where Norwich AOI goes in the future. We already have some plans for the next event, and events after that! We will be running them quarterly and they’ll range from super chill meet-ups to more formal talks and master classes. One thing is for sure; we may need a bigger venue!